Situated on 50 scenic acres along the banks of the White River in Burlington, WI, this is a must-see venue for your wedding, conference, or showers. In the privacy of the country, but close to lodging & other amenities, experience the rustic beauty of their renovated barn, with all the features you would expect, year-round. When The Landing 1841 approached us they had nearly no digital presence. We were challenged to create a website that mirrors the uniqueness and creativity of this beautiful location. The design elements included feminine and masculine colors as well as textures to reflect the rustic wedding venue. A custom calendar was developed for The Landing 1841 so that visitors could book weddings or other events online. The calendar also highlights days that are open to the public. The remaining pages on the site are designed to highlight all the information that a couple looking to plan a wedding might be interested in. 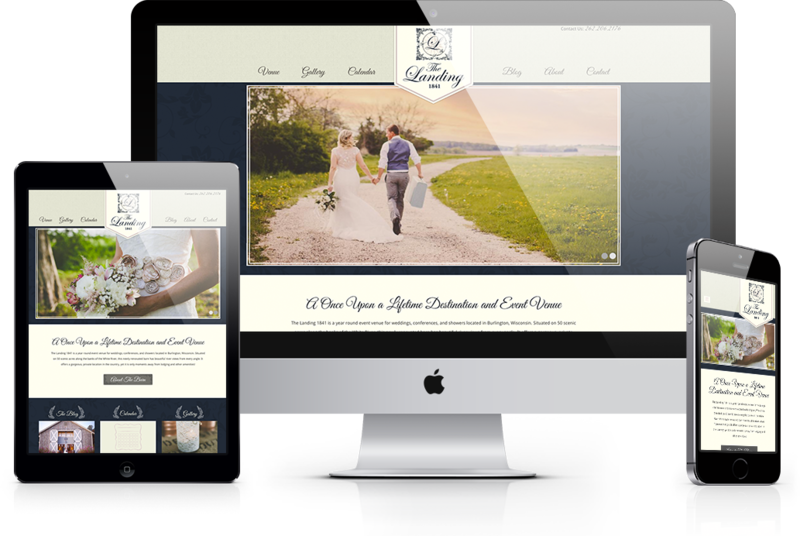 The custom built website matches the rustic elegance of the location, while also simplifying the navigation so clientele can find times and reserve space for their events. "Keystone Click nailed it from the first mock up designs all the way through the completion of the site. They listened to what I had to say and delivered a product we are proud to call our own. The staff was professional, responsive and easy to work with. Plus, they saved me precious time and energy so I could focus on other priorities. We have received so many compliments on the website and feel it's a true representation of our business. "